A few weeks ago, Sam Wood highlighted a new feature that Microsoft has included in Power Pack 3 to expose the state of various components of your server. Microsoft are using the this feature to generate the content to Windows Media Center’s new Home Server Console View, and I thought it would be useful to expose these to my iPhone so I can follow up on any messages that are generated from Alex Kuretz Remote Notification Add-In. Several hours later and I had a pretty simple app that renders the pages well on an iPhone or iPod Touch display and lets me see the status of various components of my server. Once I was reasonably happy with the concept I passed the link to Alex and we both started bouncing ideas around and WHS Health was born. So the project grew from a couple of web pages for personal use, to a full Add-In that we are releasing to the community today. There is a similar Add-In available already, P80 that has more functionality but I found it too much effort to drive on my iPhone or Touch. If you followed Sam’s article, or want to see what the raw XML data looks like for your server then open http://HPSERVER:55000/health/health.xml in your browser (replace HPSERVER with your server name). Some useful data, but not well presented! The code below is the <Storage> section and you’ll see something similar if you look on your own page. With a little bit of HTML work, and the excellent UiUIKit we turn the following XML code. To this. Maybe a slight improvement! A couple of other screenshots to give you an idea of what to expect. The console one was the important one for me and will show you any Warnings or Critical errors on your server (other than ones you have set to ignore in the console). It will also show the state of the Backup Service. 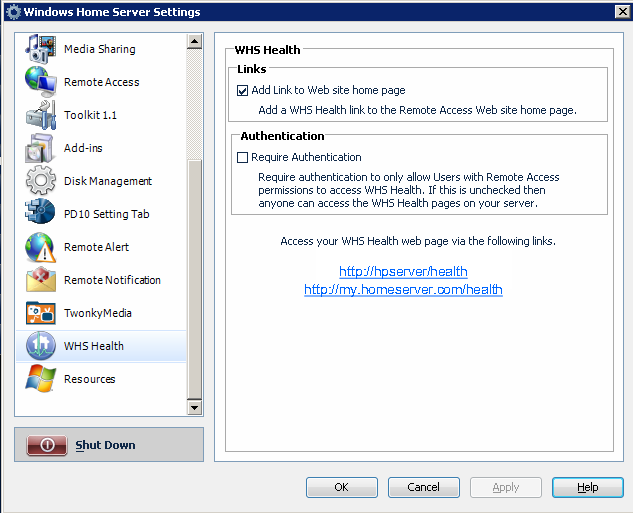 Finally, there is a Settings Tab in the Windows Home Server console that will allow you to set WHS Health to secure access only (i.e. you have to logon with an account you have allowed Remote Access) and also to update the Home and Remote logon pages with a link to WHS Health. WHS Health is now live and available to download from here. Please let us know what you think and also be sure to let us know of any suggestions in the forums. Update: We’ve updated the version to 1.0.0.7 now to check to ensure that Health.xml exists (i.e. Power Pack 3 not installed). We also now have it confirmed that it functions well on other devices, including the Android and Palm Pre phones. Nice. It just seems wrong to have it as an iPhone app though… How about a Windows Mobile version? It’s not an app, it’s a website and actually renders fine in most browsers. My WinMo 6.1 phone looks terrible, I expect in the future we’ll be working on a version that is friendly to more phones. It’s too bad that Windows Mobile is so far behind the curve, makes building usable sites very difficult. Nice work, Nigel! This is exactly what I wanted to see built from health.xml. Love it. Works (and looks) great from my Palm Pre’s web browser!!! Keep up the great work. @JohnG – Great to hear it works fine on Palm Pre, thanks for sharing! I expect most mobile platforms that have modern browsers (Windows Mobile is not one) should work just fine with this Add-In. I’d like to see a Android version of this app. I would be installing it ASAP! @COPC – I bet it works fine already, please give it a try and let us know! Sorry my bad, that is what I get for reading only the article. Phones has such small screens, LOL. I tried it on my HTC Hero and it works like a charm! Not formatting issues and it’s quicker than I had expected! No problem I posted that on the forums and WHSplus as well for us android lovers! Great idea — I’ll put a post with a link over at Precentral too. Not sure how many WHS geeks are Pre guys/gals, but it can’t hurt. I think I remember hearing one of the HomeServerShow regulars is a Pre owner / fan. Maybe he’ll comment on this week’s podcast too. My only comment on the Pre is that the initial WHS login page looks small initially. I just double-clicked on the login/password boxes and it auto-zoomed to a level that was more usable. Once logged-in, WHS Health is formatted perfectly. As for the remote page, I know and I hate having authentication ticked for that reason, but that’s the MS page not mine and I was a little uncomfortable in changing it. I totally understood that the Auth page is not yours and therefore my message wasn’t intended as a critique in any way — I just wanted to provide some guidance for other Pre folks to be sure they understand the the first screen they see doesn’t reflect the formatting of the actual app on the Pre. Many mobile ‘sites’ designed for Iphone work great on the Pre and others (EVite for example) really don’t work well for some reason. Lol, no offence taken. I did seriously consider doing something with the standard pages but I’ve seen them “updated” when Power Packs have been released. I see from the screenshots that it use the http and not the https. My server is setup only as https, will this work or do i need to open port 80 as well ? Nice job guys! I have a laptop that I backed up while it was active but I’m not backing it up anymore. In the XML under It would be nice to have the option not to show offline (IsOnline=”0″) computers in the Backups section. @Vassilis – By default it’s set up to use the built-in WHS user authentication and run over https. You can disable that and run over http if you want to make it publicly available. @Jim – This is one for which you’ve turned off backups? Would you expect it to not show up in the Server Console? IMHO this app is meant to be a mobile read-only Server Console that shows as much useful info as possible. Im getting a error code 1603, when I try to install the add-in. My WHS is freshly re-installed and its PP3 all updated. The best way to tell is to check the Additions.log file on the server for an error message and share it either here or in the forum link above. ok…figured it out….TCP port on default web site cannot be other than port 80! Your pages are working fine on the latest Windows Mobile phones from HTC that use IE6 and newer Opera browsers. Tested on the Touch HD2 and found the pages format swimmingly on both browsers, though the default Opera browser displays much better than IE6. Great work, thanks for this terrific addin! I like the fact I can drill down into several areas of WHS to understand how the system is performing. What would make this app even better is a “dashboard” that surfaces potential problems in a single aggregated view. For example, if there are console errors – show the count and severity on the dashboard. If a drive is not healthy, show it that information in the dashboard. By aggregating the information into a single view it would allow the user to quickly determine if there are issues with WHS and save a number of clicks through sub menus. Yup, that’s an issue I’m aware of and will be fixed in a future release. Glad you’re enjoying the Add-In. Thanks for the great Add-in! FYI: all pages correctly render on the Zune HD browser as well. Actually, let me retract that. The main page looks fine on the Zune HD, but the rest of the pages render just as well as my WinMo 6.1 IE browser does. Hi, where can I find the ipod app for whs health? I searched the appstore for whs and whs health but didn’t find it. It’s not an App, it’s a web page that runs on your Server. You navigate to http://yourdomainname/health and you can bookmark it onto your iPod/iPhone desktop. @Alex Kuretz: Thank you very much. I did what you say and it works, great! I’m dutch, and I didn’t understand it what was on the site. But now I do, thank you. Previous post: DataVault Owners – HP and Microsoft Needs You!